Our Queen Street branch is closing on Friday 25 May due to the lease expiring, but don't worry, there are lots of ways you can continue to bank with us. Even though our Queen Street branch is closing, our priority is still to provide products and services that help make banking really easy for you. Prefer to chat face-to-face? Pop in to visit our branches in Newmarket, Takapuna, Botany, or NorthWest. The freedom and security to access your accounts from your tablet or computer. If you don't already have Online Banking set up, just give the team a call. Quick, easy and secure banking on the go. 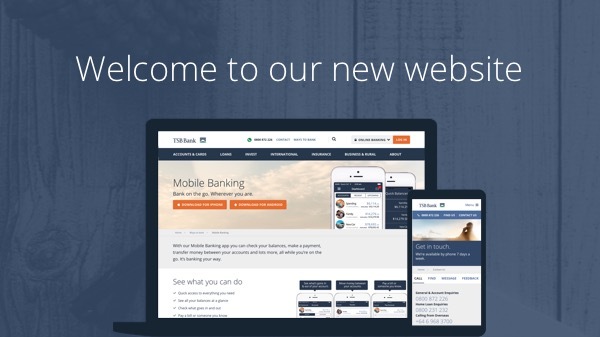 If you don't already have Mobile Banking set up, just give the team a call. The team are available on 0800 872 226 between 8am-7pm Monday to Friday, and 9am-5pm on weekends. Why is the Queen Street branch closing? We're moving out of our Queen Street branch as the lease is expiring at the end of May 2018. The decision not to renew the lease was made for a number of reasons, one of the most important being that the Queen Street site was not fit-for-purpose for either our customers or our people. We had hoped to stay in the premises in the short-term until we could secure an alternative Auckland Central branch location, but unfortunately we were unable to do so. We're still committed to Auckland and to our customers, and our objective is to find the right long-term option which meets the needs of our people and allows us to offer a better experience to our customers. This process may take some time, but it is our intention to make decisions as promptly as possible and keep those people affected regularly informed of our progress. When is the Queen Street branch closing? Our Queen Street branch will be closing on Friday 25 May 2018 at 5pm. Our ATM located on Queen Street will no longer be in operation after this date. Is TSB contacting it's Queen Street customers about the closure? Yes, we're contacting affected Queen Street branch customers from Tuesday 8 May to inform them about the closure, and provide them with information about other ways they can continue to bank with us. Customers with a subscribed email address on file will receive an email, otherwise they'll receive a letter. Customers who visit the Queen Street branch in person will be given a brochure with the relevant information. Closer to the closing date (Friday 25 May) we'll also inform our Auckland-based customers through our Social Media channels (i.e. Facebook) and an article on our Latest News page. As a Queen Street customer, can I still contact my banking consultant or relationship manager? Yes, your usual Queen Street branch banking consultant or relationship manager will still be available to help with any of your banking needs by phone and email using their current contact details. If you need banking assistance and you don't have your consultant's contact details on hand, you can also call the Queen Street branch team on 09 920 4222. After the branch closes, where can I withdraw cash or make deposits to my TSB account? If you need to use an ATM, they're located at each of our other Auckland branch locations. As per usual, you can also use any other bank-owned ATM in New Zealand free of charge1.